All released balloons return to the earth as litter, mostly in fragments, polluting both our land and seas. They, along with their attached ribbons, pose a huge threat to marine and wildlife as they resemble edible items to the animals. When an animal ingests these fragments they are usually killed from the balloon blocking the digestive tract, leaving them unable to take in any more nutrients resulting in the animal slowly starving to death. Animals can also become entangled in the balloon and/or its ribbon rendering them unable to move or eat and again slowly starving to death. Sea turtles are especially vulnerable to ingestion as they naturally pray on jellies which balloon fragments can easily be mistaken for. Six of the world’s seven species of marine turtle occur in Australian waters three of which are considered to be critically endangered. Birds too are extremely susceptible to entanglement as well as many other animals. Penguins and even seals have been documented as being injured or killed by becoming entangled in a balloons ribbon. As balloon releases are becoming more and more prevalent in celebrations, memorials and at charity events it is vital now that laws be made to put an end to the deliberate littering of our environment. There are so many other ways to commemorate occasions than something as irresponsible as balloon releases. Even those marked ‘biodregadable’ can take months to years to fragment, during which time they are still rubbish, and still provide risk to wildlife. 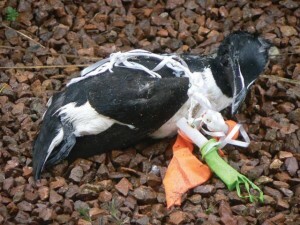 Sign petition: Petitioning Minister for the Environment The Hon Greg Hunt MP to Ban Ceremonial Balloon Releases Due To The Negative Impact On Marine And Wildlife.